Babblings of a Mommy: Indulge With Lollia In The New Year. (Review & GIVEAWAY)---CLOSED. Indulge With Lollia In The New Year. (Review & GIVEAWAY)---CLOSED. That's where Lollia comes in, ladies. They specialize in luxury bath and body products. I recently discovered them a few months ago when I received the Breathe collection as a gift, and I honestly don't know how I've been living without them for so long! These products are AH-MAZING--Super luxurious and delightfully aromatic. "Lollia is created by designer Margot Elena, an innovator of luxurious formulas and signature packaging for over a decade. Margot is well known for her first company, Archive, a well established luxury bath brand. She has designed products for some of the nation's top retailers including Restoration Hardware, Disney and Red Envelope. 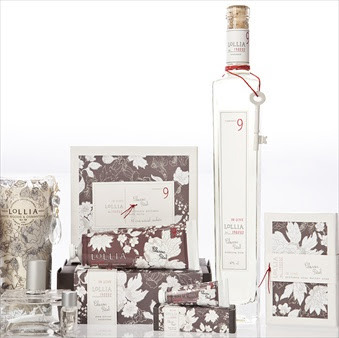 ...Lollia is a world created with lovely details, blushing fragrances and flirtatious touches. " Lollia was extremely gracious enough to send me their "In Love" collection to try out. In Love is a delicate infusion of apple blossom kissed sweetly by Jasmine, floating upon the breath of the truest living rose. Sounds lovely, doesn't it? Well, it smells just as lovely too! So, what was I lucky enough to review? Let me tell you ladies, the bubble bath produced the most fluffy perfumed bubbles and not only does it create the most inviting portrait in your bathtub, but it has moisturizing olive fruit, avocado oils, and Vitamin E in it too. The handcreme feels luxuriously rich. It's neither too sweet or too strong, and it has the perfect balance of fragrance. It's made out of macadamia nut & avocado oils with extracts of aloe and shea butter leaving your skin super soft. The bath soap smells amazing in the shower and leaves your skin perfumed all day. It's made out of Shea Butter as well. Not only do all these products feel and smell wonderful, but I have to make note of the beautiful packaging as well. The In Love collection is adorned with a white rose motif and a slate gray backround creating this super modern and elegant design. Well lucky for you, not only does Lollia want me to pamper myself this new year, but they want one of my readers to pamper themselves too!! Tell me why you need a little pampering this new coming year. Become a Facebook fan and "like" my page. Be sure to leave a comment about the giveaway! Follow me on Twitter and tweet this: "I hope I win The Lollia giveaway from http://babblingsofamommy.blogspot.com @babblingofmommy"
It's that simple! Remember each one counts as a different entry so be sure to enter them separately. Giveaway ends January 10th . A winner will be selected by random.org and will be announced on my blog, so be on the lookout for your name! *products were provided for review purposes. See disclaimer/disclosure for more info. i need some pampering since ive worked hard all 2010 - its been a rough year! I voted for you on Top Mommy and Picket Fences. I have worked hard this year and I need some pampering! I've got twin daughters, I'm planning my wedding, fostering animals, volunteering...and running two businesses!! I would LOVE a reason to take a nice lingering bubble bath!! I do need pampering. My husband and I have had a rough year, and we need to feel like we are starting all over in the New Year with good vibes and good health. This year has been trying -- our income dollars keep going down, but our expenses somehow keep going up. There must be a mathmatical law explaining that (smile). I'd therefore love some pampering. Liked Lollia on FB, and subscribed. I received some Lollia as a gift for christmas and I had never heard of it, it's amazing so beautiful and soft not overpowering I love it and I am hooked. I suppose I would just say with work and raising a family I put everyone first, so anytime I get a chance to indulge it's always last minute or rushed, it would be nice sometimes to really remember what it's like to focus on me and not think of anything else. i lost my father 2 days before thanksgiving and my mother had a break down from it all. In Love Classic Petal Bubble Bath - This is some serious stuff. If your lady (or the lady you want to be yours) loves luxury and loves a good bath this is the gift for her. Pair it with the "Love" lotion and she will LOVE you! I think that I need some pampering this new year since I'm starting College Jan 13 and I'm a very busy blogging mommy! I like LolliaLife on Facebook. Following your blog with GFC. I like you on Facebook and left a comment. I'm moving 1500 miles away from everyone I know in the name of adventure. Exciting, yes. Terrifying, yes. Will I be in need of pampering? Yes! I need a little pampering this new coming year because I deserved this by working hard all this year!!! Thank you for such a great giveaway!!! I Like Lollia on Facebook! I became a Facebook fan and like your page and leaved a comment about the giveaway! I'm going through cancer treatment, & could use the pick me up! I subscribe to this RSS feed so I don't miss a thing! I have gone through to much this year! A marriage, a divorce, hectic year. This could be good therapy!! I have a 24 yr old son that is handicapped and my 4yr old grandson lives with us. I love them both very much as I do my whole family. I guess I haven't been ask this question before so I took advantage. Thanks for the chance to win. Like many people, I lost my job and when I get a bit down, I love to take a bath with perfumed soap or bubbles. Thank you for the chance to win! after work i am so tired that all i want is a nice hot bath, this would make it even better! i need some pampering because i'm sleep deprived. my baby has a double ear infection and RSV and my oldest is just getting over a terrible stomach virus. i need pampering this new year because I'm going to be trying to really get a literary agent in the coming months with my current manuscript. PLUS, I'm a college student and that's always hectic. I had a really rough 2010 with health scares and financial woes. I definitely need some pampering in 2011. I voted for you on Top Mommy blogs and Picket Fence. I need some pampering for all the working out I did in 2010 and will continue in 2011. The holidays wore me out! A little pampering would be divine to help recover! I could always use a little pampering. I teach Kindergarten and have two boys at home ages 1 and 3. I need a little pamper so my body can keep up with my "To Do List". I need a little pampering as i never take time for myself. I'm on disability for post traumatic stress disorder. I need all the pampering I can get. I follow on twitter and tweeted giveaway. I'm tired of feeling unlucky in love, I could use a little self pampering to boost my confidence! I need a little pampering~this was our first Christmas without my Mom.. I am a hard-working person and did not have the chance to pamper myself at all in 2010. This is the reason why I am participating in this contest. Thank you for the opportunity. I "like" Lollia on Facebook (catalina khalaj). I follow you via Google Friend Connect (as CatalinaK). I have subscribed to your RSS Feed (via Google Reader). I am a new Facebook fan (catalina khalaj) and have just left a comment regarding your Lollia giveaway. Why I need a little pampering this year? Jan. 1st I lost a co-worker and friend of mine. My hubbie's grandmother isn't doing well, not sure how much longer she's got left (Stage 5 Lung Cancer), I teach 26 NEEDY second grade students, and take care of my family at home. Thanks for the opportunity! We totally deserve pampering because we've had a really rough 2010. Any luxury would be welcomed, albeit strange to get used to but we think we can manage! p.s. We'd love for you to linky up your giveaway on ours!! !